In October I was invited by Laurie Kaufman of RE/MAX to join forces with her to do a fundraiser for Longmont Humane Society. She would bring her clients with dogs in to the office where we set up a photography studio and I would photograph them for Halloween. It was a great success! Many people came with their dogs, and even one cat for photos, although none of the animals were thrilled about wearing costumes. I took lots of pet photos and gave out lots of treats and I received lots of tail wags, licks and kisses. Eager to Pose for the Camera! This is a really well written article by Scott Smith of Consumers Advocate, located in Puerto Rico. Click here to read the article. The article is about Hearts Speak, an organization that I am a member of that connects artists like photographers, videographers, painters, graphic designers, etc. to animal shelters to help get pets adopted, among other great projects. This kind of organization needs this kind of well deserved praise and exposure. There is a lot to say about but I will say no more…….. just read the article and you will be thoroughly educated on why Hearts Speak exists and why they are making a difference in the animal rescue world. Here are some new faces and some old faces at Longmont Humane Society. A couple of these dogs were adopted before we even had a chance to post their photos, like Randall here. Most dogs do get adopted quickly, but once in awhile you have dogs like Blanca and Grace who take longer to find their forever homes. It’s not their fault though. It’s usually just because they don’t get along well with other dogs or cats. Otherwise, they are perfectly loving and personable dogs. I’m glad I volunteer at a shelter that gives them all the time in the world to find their perfect match! 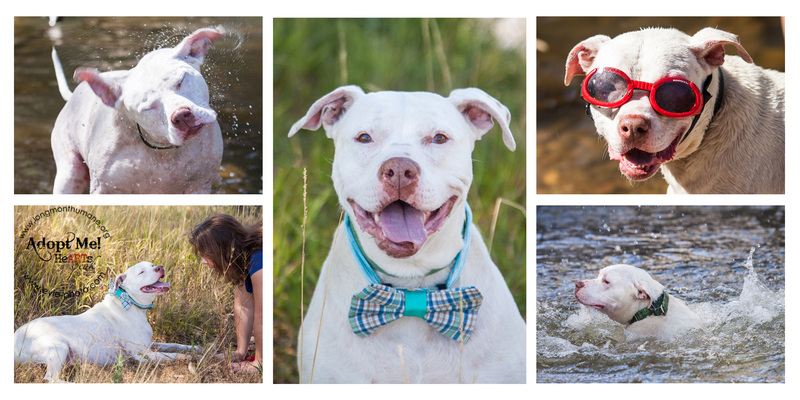 This summer I had a new background made for my outdoor dog photo sessions at the shelter. My outdoor options there are challenging because I have harsh mid morning sunlight with very little shade and the green bush I had been using as a background is now dying and not looking so good. So my brother, a very talented carpenter, put together a “fence” so I could produce a “dog in the back yard” kind of look. Here are a few samples of the new background. The fence took an afternoon to make and cost around $40. Today at the shelter I photographed this boy, Koda. He is quite photogenic and we discovered he knew a few tricks like sit, down, shake and sit pretty. It’s really fun to find out these things while creating dog portraits. These are things we didn’t know before but now we can this info with potential adopters. Since he was so good in front of the camera, we showered him with flower petals for some extra fun shots. This is Porgy. I have photographed him four times over the past several years (maybe five years?). He is one of the most amazing dogs I’ve ever met. Porgy came to Longmont Humane Society after spending nine months in a Chicago shelter while his owner was awaiting trial. Porgy had been neglected, abused and abandoned. LHS is well known for their training program so the Chicago shelter wanted to send him there, to help rehabilitate him. Porgy was a great student and learned many things to help him be a good dog for the right family. It took awhile to find a home for Porgy because he does not like other dogs. He does however love children. Sadly he was adopted and returned several times, for reasons not having to do with him. I believe that over a five year period, he was adopted and brought back three times. Porgy is now nine years old and waiting for his next family to come and get him – hopefully for keeps this time. What amazes me about him is his on-going positive attitude. He is always smiling, happy to see anyone who wants to say hello or take him for a walk. And each time he comes back to the shelter he doesn’t get sad and depressed. He smiles and wags his tale, seemingly happy to see old friends and looking forward to his next stop. We so hope his next stop will be his last stop and that it is the best home any dog could ever hope for. 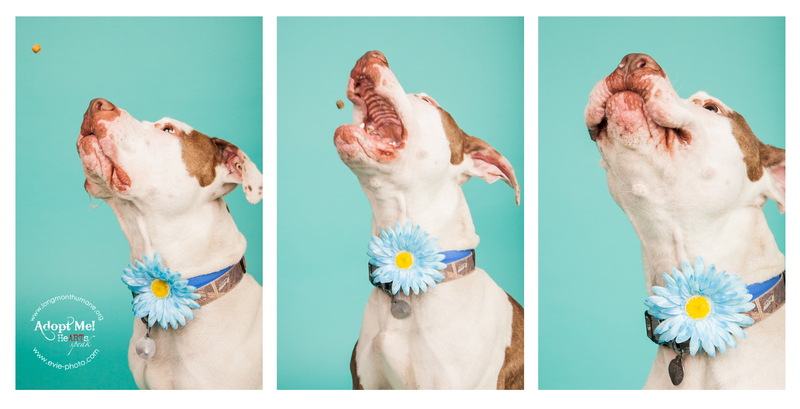 Photographing high energy dogs in a shelter environment can be challenging. It can be hard to get them to sit and focus long enough for you to take a good photograph since they have just come out of their kennel and need to run off some steam. We however have limited time in which to get our photographs. When we get a dog like this, we use his personality and energy to our advantage and capture fun and whimsical images along the way. 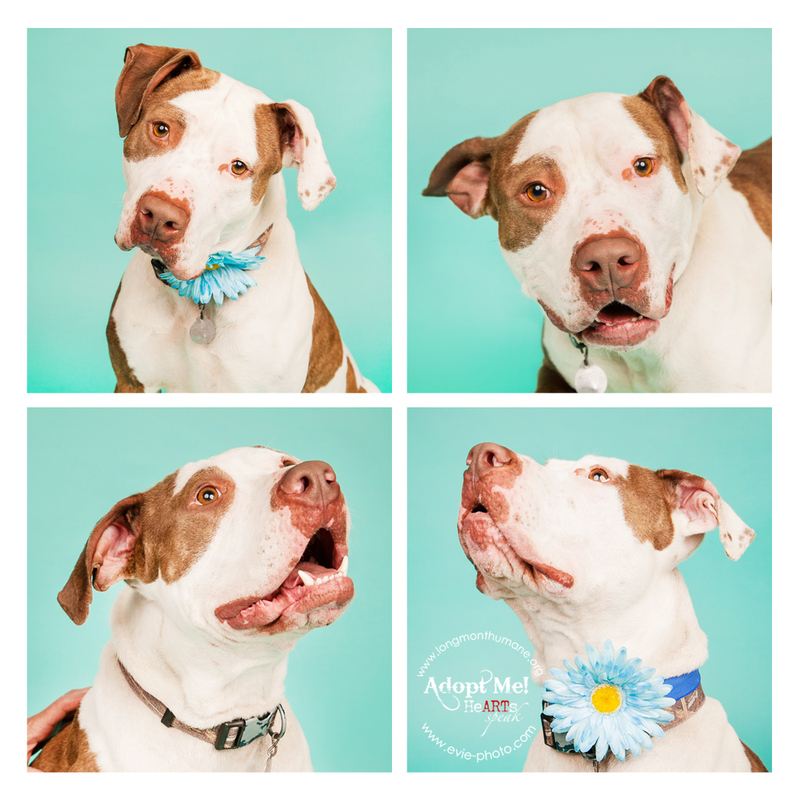 This handsome guy Walker, is always loaded with energy, but he responds well to being asked to engage in an activity. My handler worked with Walker by running him around the room on his leash asking him to focus on her while giving him treats. We then made a game out of treat catching. We had him sit and catch treats which he thoroughly enjoyed! Finally after 20 minutes or so, he was happy to give a nice pose for the camera.